In other news, “Jake Shimabukuro: Life on Four Strings,” a documentary by Tadashi Nakamura, was screened at the Smithsonian Institution in November and will be shown at the Seattle Asian American Film Festival this weekend (sold out). It was an official selection of the San Diego Asian Film Festival, Toronto Reel Asian International Film Festival, and Napa Valley Film Festival. The film is a compelling portrait of an inspiring and inventive musician whose skills on the ukulele transformed the instrument’s understood potential. Through intimate conversations with Shimabukuro, “Life on Four Strings” reveals the cultural and personal influences that have shaped the man and the musician. Sony Music Japan International (SMJI) will be releasing the Japanese version of Shimabukuro’s “Grand Ukulele” in March, only in Japan. The album will feature not only the 12 original tracks but also one exclusive bonus track. A limited-edition album will come with a CD and a DVD of Shimabukuro’s live performances. 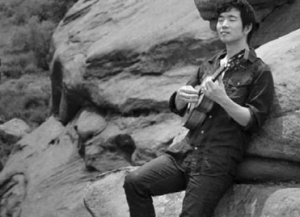 For more information, including the complete 2013 tour schedule, visit http://jakeshimabukuro.com.